Ultrasound images can aide in the diagnosis of musculoskeletal injuries in our patients. Long used as a diagnostic tool in horse lameness, musculoskeletal ultrasound can be just as useful in dogs for diagnosing injuries as well as monitoring the success of rehabilitation therapy. 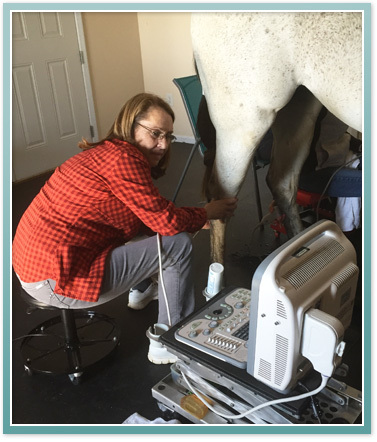 Dr. Young recently participated in 2 days of training with expert ultrasonographer and Equine Surgeon, Dr. Carol Gilles. "Though our patients were horses, the texture of the tissues and structures as well as their response to injury are the same in dogs," Dr. Young states. "Knowing the amount and quality of healing via ultrasound helps us develop optimal exercise and treatment plans for each stage of the healing process."